Brooklyn is the most populated borough of New York City, divided up among ever changing neighborhoods. The borough buzzes with cultural attractions, including boutique galleries, dance companies, artist workspaces, burgeoning restaurants, beer gardens, and distinct ethnic neighborhoods. Although the face of Brooklyn is always changing, one thing remains the same: Brooklyn plays an important role in the identity of New York City. 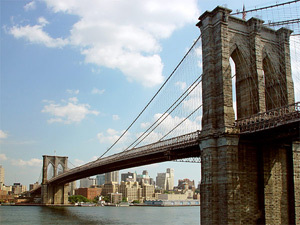 One of the most current and relevant parts of New York City is Brooklyn's Dumbo neighborhood, which sits beneath the Manhattan Bridge Overpass (Dumbo stands for Down Under the Manhattan Bridge Overpass). Within close proximity of the Brooklyn Bridge, Dumbo is within minutes of Manhattan, but it has a personality all its own, including large loft homes that are attracting savvy investors who want something a little different and outside the bustle of the island. With gallery openings and festivals practically every weekend, and convenient access to the other boroughs, our drivers know Dumbo as well as they know the streets of downtown Manhattan. Getting from the airport to Brooklyn can be quite the journey, and you may arrive more exhausted than you imagined you could be. While many cabs don't traverse between the boroughs, New York Limo crosses the neighborhood lines easily, as our drivers are skilled in navigation no matter what part of the city they're in. Whether you're welcoming yourself home after business trip or traveling from Brooklyn to the world beyond, our drivers will make sure you get to your plane without the stress and hassle of other modes of airport transportation. As Brooklyn makes a name for itself in the art world, more and more gallery openings and gala events require transportation for those unfamiliar with the area. At New York Limo, we understand your need to get to the right gallery safely and on time. In a borough where art is business, social meetings and financial transactions are often one in the same. By relying on New York Limo for your transportation needs, you'll eliminate the concerns about parking or finding a cab in these small nooks and crannies of Brooklyn. Instead, a professional driver will pick you up or drop you off right at the front door.